Silver Scarab is an Egyptian themed game, which got its own little niche, focusing on the famous scarab, here shown in the form of an amulet. While others are mostly focused on certain gods or on Cleopatra, this classic slot machine has a much less common approach. It’s a game from Microgaming, and they have quite a few titles with an Egyptian theme, including some which are with 3 reels, just like this one. This classic Egyptian slot has 3 reels with 1 bet line. It also has one wild symbol, very impressive graphics and a top prize of $20,000. The slot does very well graphics wise, plenty of details included, but the features are rather basic. The only thing you’re getting here is a wild symbol, and of course it’s the image of the Scarab that is used for it. It also acts as a bit of a scatter. The Scarab, whenever it appears on a payline and manages to substitute for another symbol, will help you create a new combo. Either one or two Scarabs will do this, depending on how many land on the payline. When two are there, whatever third symbol appears there will determine what combo forms. When one wild is on the line, you need two matching regular icons there as well. As for the scatter ability of this wild, it comes in when you have three Scarabs in random positions. This will pay 1,000 coins. It’s better to get the three symbols on the same line, since that brings you 4,000 coins. Since you only have one line in the game, you can get away with a one coin wager if you want to. You can also increase your wager up to three coins for that same line. 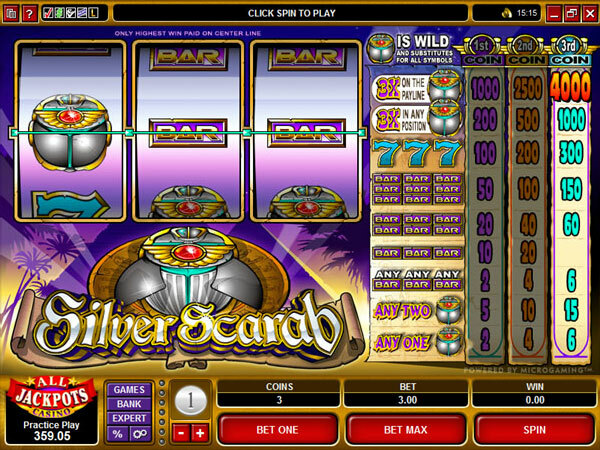 The value of the coins is typical for Microgaming, the range being $0.25 to $5. As for the maximum bet, you will have to invest $15 per spin if you want to go that high. Depending on how you get the three Scarab wilds, you can get paid 4,000 coins, or only 1,000. If they appear on the same line, you get 4,000 coins, or up to $20,000. I enjoyed seeing a lot of details that are included in this game, which is not something you expect to see from most slot machines. Egyptian themed games are a dime a dozen, but this one actually looks half decent, which is rarely the case with 3 reel slot machines. Even the classic symbols look like they are Egyptian themed. Symbols: Scarab (wild, 4,000 coins), Blue 7 (300 coins), Purple Three Bar (150 coins), Purple Two Bar (60 coins) and Purple One Bar (20 coins). Normally I’m not a big fan of the Egyptian theme, but since this is a classic slot and the design is so good, I have no problem overlooking this choice. In most ways the game is a very classic title though. 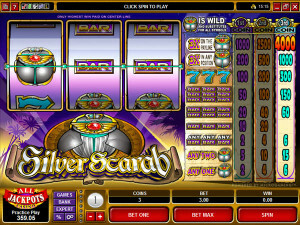 This Silver Scarab slot is offered by all online casinos with Microgaming software, playable either in practice or in real money mode.